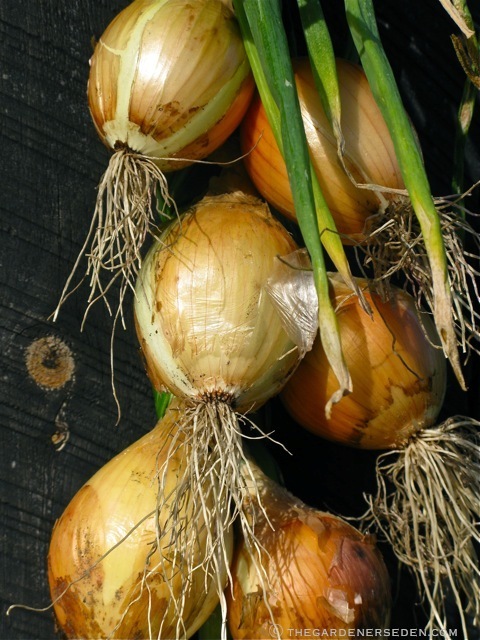 Tears of Joy: In praise of the Onion…. and my favorite French Onion Soup! If the end of summer is bittersweet, then I will credit the humble onion for some of the sugar. On a chilly autumn day, I am a complete pushover for a bowl of French Onion soup topped with a thick layer of gooey, delicious Gruyere cheese, (see my favorite recipe below). 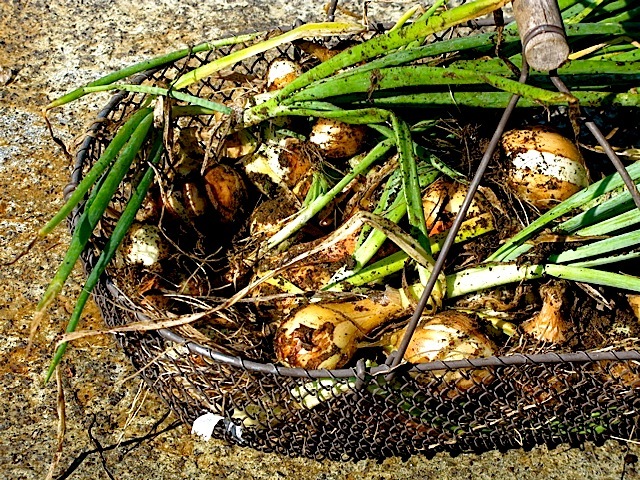 I love cooking with onions, and I plant many varieties. Onions are tireless kitchen workhorses, adding sweet flavor to homemade pizzas, stews, tarts, dips, salsas and virtually every savory dish I love. 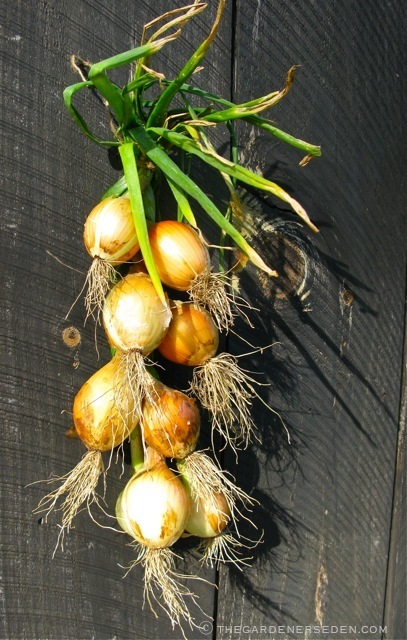 Onions are easy to grow, but they are a slow crop requiring months from seed germination to maturity. So in cool climates with short summers like mine, the seeds need an early start indoors. I usually buy my onion starts from local, organic Walker Farm. But if you live in a warmer climate, you can sow onion seed directly into the ground. Although onions do prefer a slightly sandy loam rich in organic matter, they are otherwise easy to please. 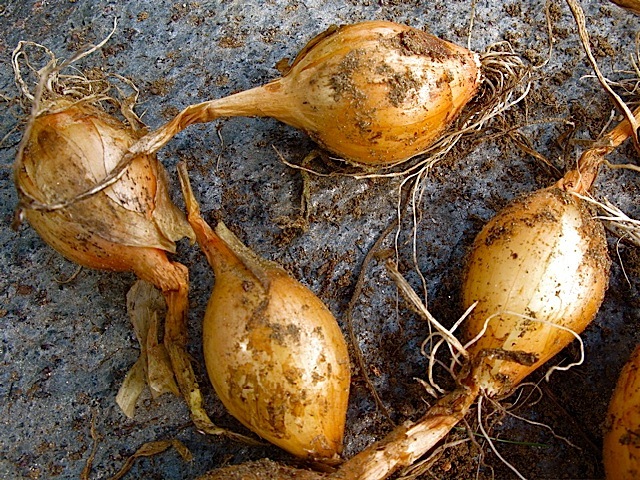 In fact, over-fertilizing bulbs will result in lots of green but little onion, so be modest in applying fish emulsion, (once a month is more than enough in well prepared garden soil). 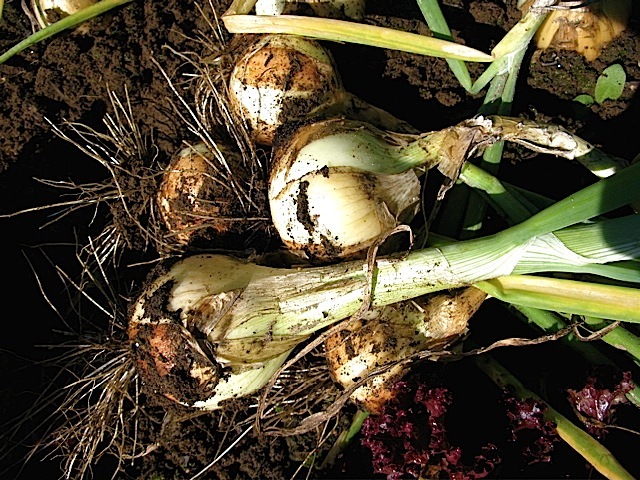 Keep onions well weeded, and be very carefully when using tools, you don’t want to damage bulbs growing close to the surface. 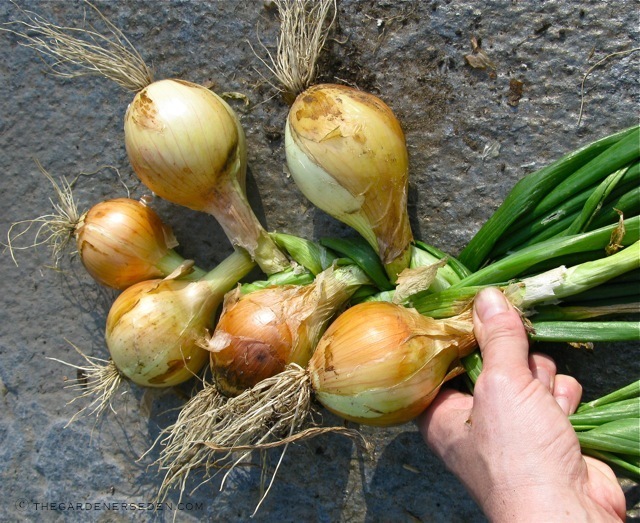 In late summer, you can tell when mature onions are ready to harvest by watching for the ‘flop’. When most of the tops have bent over, your onions are ready to pull. 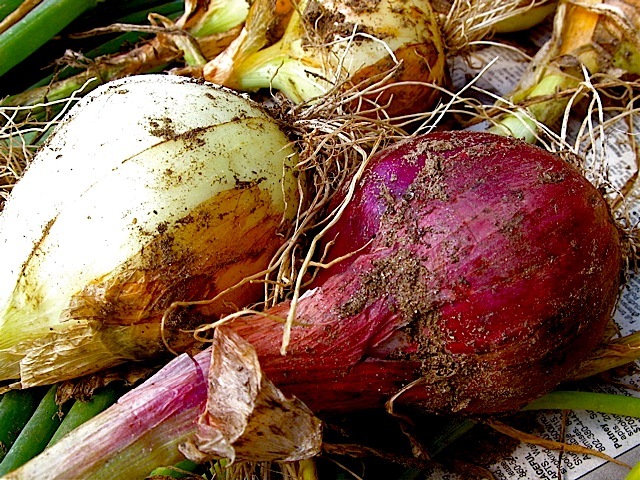 Of course, like most root vegetables, onions may also be harvested before maturity. 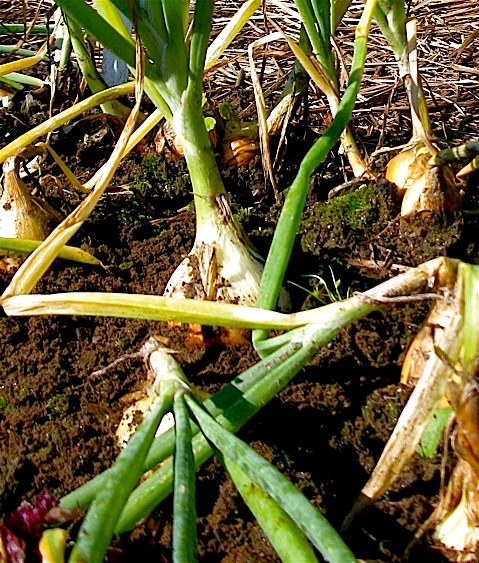 Sometimes early-harvest onions are called ‘scallions’, but this is technically incorrect. 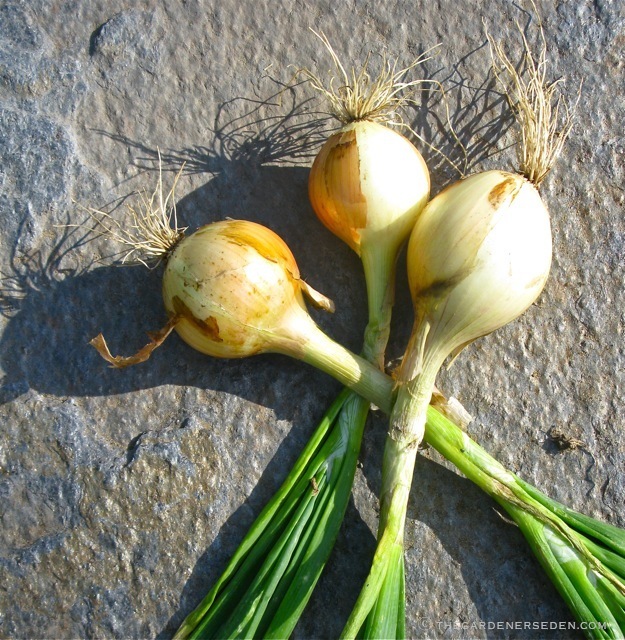 Scallions, (or bunching onions), have a milder flavor, and are distinguished by their mature bulb-size. 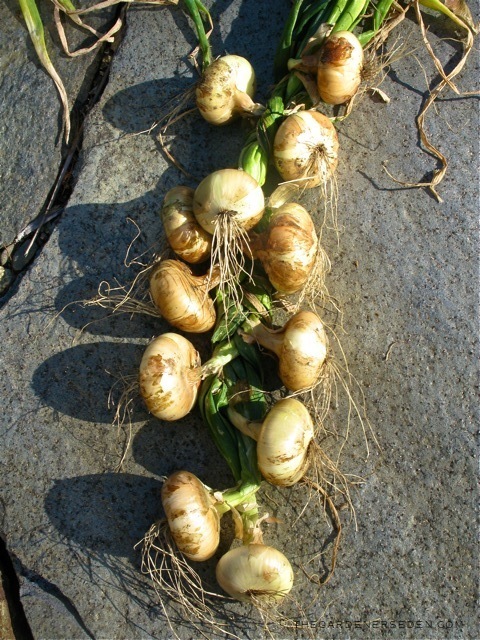 A true scallion produces a bulb no larger than the base of its leaves. 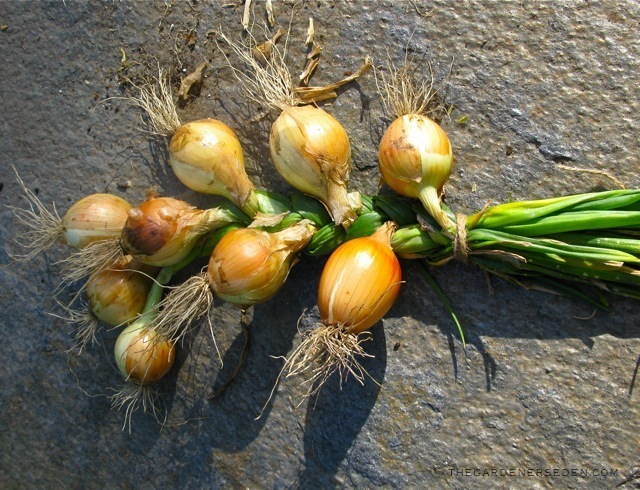 Shallots, also a member of the onion family, have a mild flavor and are very useful in creating delicate sauces. 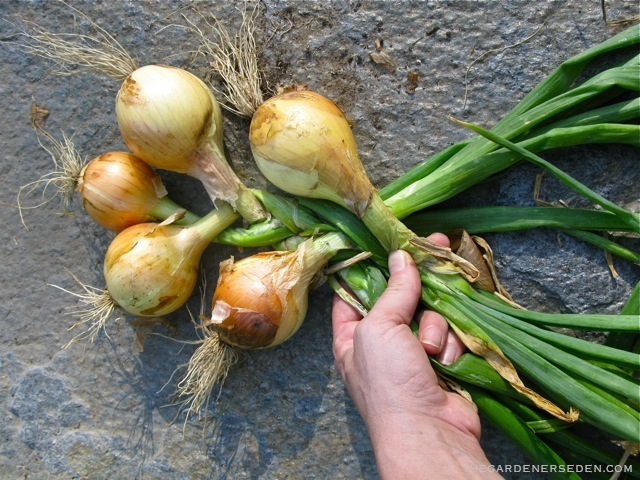 When most of the tops have fallen over, carefully pull the onions from the soil and give them a good shake to remove some of the soil. 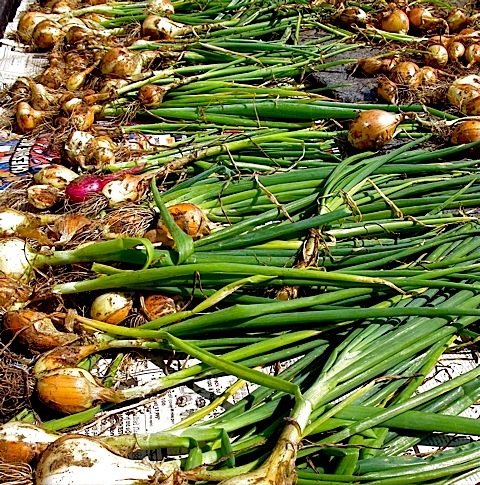 When storing onions, it is important to carefully dry-cure them in a well-ventilated, low-humidity space. If the weather looks clear for a week, I will harvest mature varieties and spread them out on newspaper in a corner of the hot, sunny terrace. There I allow them to ‘cure’ for a week, rotating, shaking, and brushing them clean throughout the drying process. 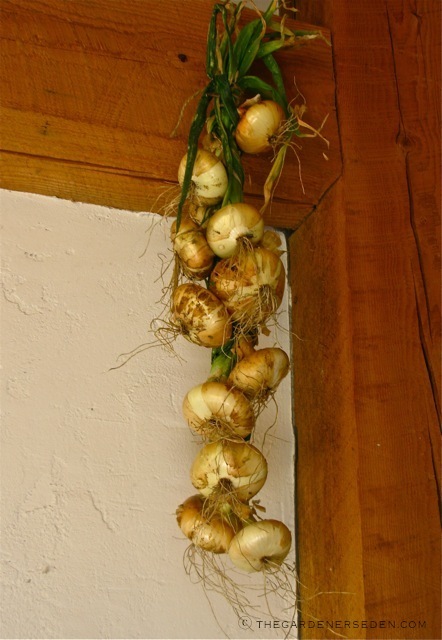 Walla Walla and some of the other poor-candidates for long-term storage will be braided and hung in my kitchen, while the shallots, as well as the firm red and yellow onions will be placed in nets and suspended from the ceiling in my cool, dry cellar. 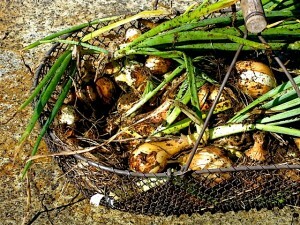 I use onions throughout the winter, so I grow a wide variety of easy-to-store types, as well as some for immediate use. 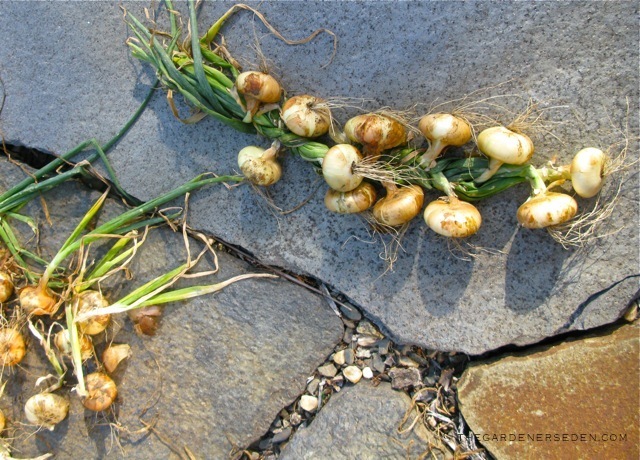 I cook with shallots on an almost daily basis, (especially in egg dishes), and this year I have quite a large harvest of this favorite culinary herb. I am also a big fan of sweet onions. Walla Wallas have been popular for over a century; their mild, sweet flavor adding complexity to everything from soups to casseroles to steamed and grilled dishes. 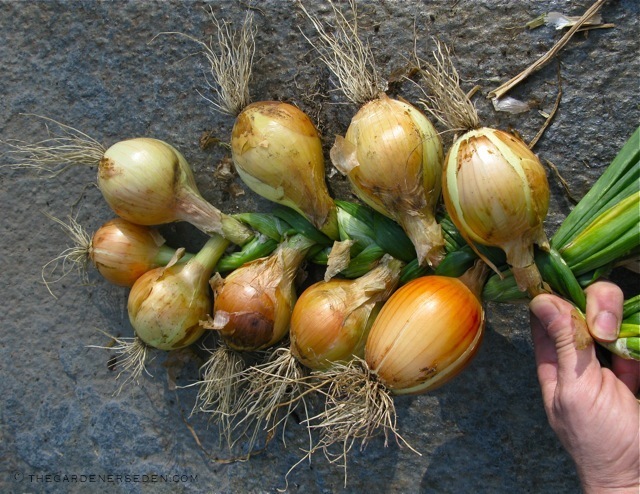 Spanish yellow onions and sweet Alyssas are also delicious. 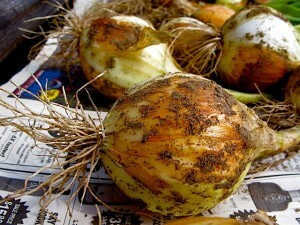 But the Cipollini Italian button onion (aka Cippolino) is my current favorite of the Allium cepa cultivars. Cipollinis are slightly sweet and wonderfully mild yet pungent. I love them roasted and grilled and used in panini. 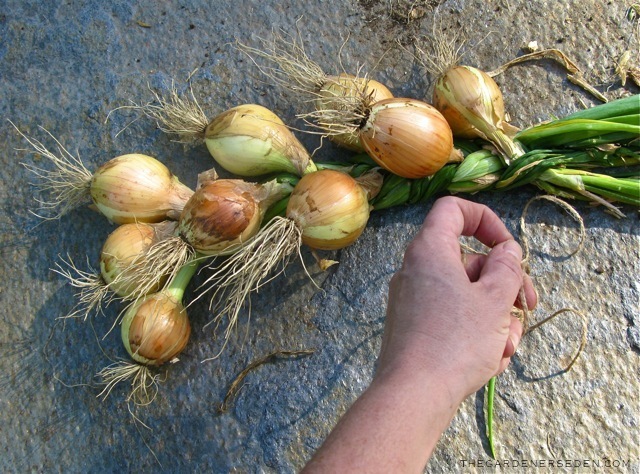 Cipollinis are beautiful onions, and I like looking at their flat tops displayed in braided bunches, hanging from my kitchen beams. Preheat oven to 400 degrees. Place the onions in a covered large roasting pan or good sized Dutch oven. Coat onions generously with butter, salt and freshly ground black pepper. Roast 2 hours or more, turning occasionally, and scraping the bottom of the pan until onions are golden brown, tender and soft. Test with a fork. Remove from oven. Move pot to burner and bring heat to medium high. Cook onions, stirring constantly with a flat edged wooden spoon, scraping the pot as you go. After onions are nicely brown and crisp on top, (15-20 minutes), raise the heat slightly more and add wine, (or sherry), 1/2 cup at a time. Continue adding wine as the liquid evaporates, scraping the pot to deglaze as you stir. Reduce heat and add chicken stock, herbs, salt and pepper to taste. Bring the mixture back to a boil for one minute, reduce heat and simmer for 30 minutes or more. Meanwhile, spread the French bread slices on a cookie sheet and brown in the oven, (set to 400 degrees), for a few minutes. Watch carefully. Rotate the bread to brown both sides. When ready to serve the soup, ladle portions into oven-safe ceramic bowls. Float the bread on top and sprinkle with the Gruyere cheese. Place beneath an oven broiler until the cheese is melted, but watch carefully. Add more grated cheese if necessary. Cool the soup for about 5 minutes before serving. * NOTE: You may also save the broth for several days in a refrigerator to use for hot soup later. I actually find this enhances the flavor, and I often double the broth recipe to enjoy the soup all week. You are currently browsing entries tagged with storing onions at The Gardener's Eden.